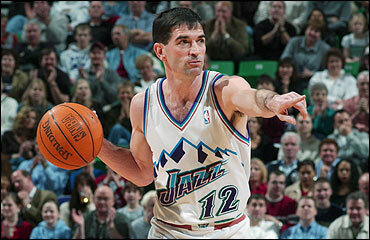 Message: One of my all-time favorite NBA players when I was a kid was the Utah Jazz’s John Stockton. Stockton never reveled in the limelight. He was more content zinging laser-like passes and soft alley-oops to his larger than life teammate, Karl Malone. As a matter of fact, Stockton still holds the NBA all-time assists record, dishing out 15,806 throughout his career. Guess what? It is time to get your John Stockton on. The Christian teacher may be restricted on preaching the gospel in a public school setting; however, there is something called free speech that protects Christian students. All those kids need are the opportunity to slam home a point, rocking the rim with a thunderous dunk. This can be done any time, at any level, in any setting. And you get to set them up with a stunning assist. Let me tell you a story from my 3rd hour this past week. We had just finished reading Freak the Mighty, and I had listed 12 questions on the board that were to be discussed that day. The questions themselves were not religious; however, they provided the opportunity for a Christian perspective. Something bigger than the world to help these kids through life. Planted amidst the class were two of my phenomenal FCA leaders. Discussion began. The kids got to pick the ones they wanted to talk about. Every conversation seemed to lead us back to the question of life and death. Hell and eternity. You see, the main character of the story, Kevin, dies at the tender age of 13 from morquio syndrome. Kevin had this belief that he would be healed with a new body in heaven when he passed. Before long, students were in a heated discussion about eternity. What happens when you die? How do you deal with death in a productive way? How can we live our lives to the fullest so we won’t have regrets on the day we die? My Christian kiddoes stole the show! One of them boldly proclaimed her belief in heaven, enlightening the class about our reward in eternity. The other student, politely refuting another student’s Buddhist belief, spoke about being healed in heaven. This is explained in Revelation 21:4 when it says, “He will wipe every tear from their eyes, and there will be no more death or sorrow or crying or pain. All these things are gone forever.” I nearly wept at their brilliance. The phenomenal thing was that their boldness allowed those students who were on the fence to come out of their shells. A sprinkling of others probably did not even know they were allowed to talk about Jesus in class, yet the confidence of my two FCA leaders told them it was okay. By the time class ended, the gospel was proclaimed. And all I did was simply set the scene. The students took care of the rest. So, I ask you … which Christian juggernaut is hungry to slam home a point? How will you get them the ball? Once the rim is rocked, how will you follow up their point with another question that will put on a full-court press? It is time to look to our students for help. Let them be lights for Christ. All they need is the opportunity to shine. Challenge: Think up some creative ways to utilize the Christian students in your classroom. Whether it be a lesson on character or a deeper question about ethics, get those Christian students the ball. God will empower them to slam it home! Prayer: Lord, I pray for my bold Christian students. Give me creative ideas on how to utilize them to spread Your Word. Amen.